This weeks Player Of The Week went to Strike & Spares Amaad Bhatti. Amaad averaged roughly about 40 pins above his season’s average. He bowled some big time strikes in the 10th frame when his team needed it most .Amaad also won all 3 of his match up’s along with helping his team sweep the number 2 team in what looked to be a one sided affair . Player of the week Runner up was Gage Nestor . Gage helped his team win 2 out of 3 games . He won all 3 of his match up’s and bowled a high game of 244. Ayaz Daddy Dar brings you his weekly segment Balls of Fury. This weeks guest includes Strike & Spares Captain Raza Dastgir . We said last week that this is the team to watch out for. After taking 19 points from Strike Kings, will teams finally take Balls n Strikes seriously? Will someone please help out Don Ali? Don bowled for an average of 218 this week and Strike Kings only won 4 pins. This team went from being a favorite to slowly a team that no one fears. The question isn’t whether this team be in first place when the regular season is over. This team is by the far the most dominating team in the league. The question is when should they rest their players, so they will be fresh for the playoffs? Daddy Dar finally backed up his mouth and took Yash and the rest of Asian Sensation to school. Is it possible that the defending champs are underrated? Another week of trash talking another defeat. Maybe Yash and the rest of Asian Sensation should practice more instead of posting articles on Facebook on how they are going to win. No one said Force was a favorite to win a championship, as Las Vegas had them at 100-1 odds. But did anyone really think this team would fall to last place? It is early, but this seems to be the team that will struggle throughout the entire season. I hope I’m wrong. A demoralizing defeat to the number one team in the league Strikes and Spares where they only got 3 points. They will have a rematch next week, but are the Pin Smackers going to wake up? I guess we will find out during the rematch next week. Snipers are slowing creeping up the leader board as they took 16 points this week. Uday finally showed up to bowl as he had an average of 136.7 last week. If Uday keeps on practicing and gets better is there any team that will want to face them? The 4 Horsemen of the winter season. Mufty with a 40 pin handicap and bowling at a high level makes this team close to unbeatable. Raza when motivated and focused is a 180 bowler. Naeem is one of the most improved bowlers who has a 200 point game to his resume. What makes this team scary is that the new leader of SA-Bowl and the NSA party Jason Reis has only bowled one series; and they're still in first place. He adds the ability to go over 220 any game and is one of the best closers in the game. That makes this team near unbeatable. It isn't just the Abhi show. Abhishek is doing his thing. But guys like Adam have really turned it up. Eugene one of the top 10 bowlers in the league very quietly takes care of business along with Sony "Sneaky Sneaky" Singh. Both of these bowlers don't cause fear in the hearts of the opposition, but they bowl very well and allow Abhi to bowl in his smooth style with out any real pressure. Khaled has been on a tear recently. Yash has really upped his game. Jin has been bowling 120 games plus 200 games. This team can match the trash talking to any team in the league. But now they have a lot more bite with their bark. This team is seen practicing and the practice is paying off as the team is really turning it up in the leauge. Even with shoddy attendance they are ahead of teams like the Strike Kings and Pin Pals. Imagine if they have Khaled very week going forward? This team looks completely different once Eddie is there. If he is there then Don Ali has the second bowler to take the pressure off of him. If he isn't there then Don Ali is the only bowler on the team who can consistently bowl above a 180. Ammad has made major strides as evidenced by his 200 + game 2 weeks ago. But the key is consistency. Nisar and Raheel make up a good core. Raheel has shown real signs of becoming a legitimate force in the league but he isn't there yet. This team has a lot of #3 bowlers but no clear cut #2. Once Eddie comes in consistently and or in the playoffs this is going to be a team that no one will want to face. The Daddy of the league Ayaz is now asking who is Daddy is. The team the defending champions have lost Riz and Moe. The lack of depth is really hurting this team. Asif when he gets going is one of the best bowlers in the game. But showing up a few minutes before start time week in and week out, means that this team doesn't get to warm up like the other teams. Without Chris and Dave bowling well, this team has no chance against most teams. But if Chris and Dave have it, then this team is one of the league's best. The consistency of Chris and Dave will decide how far this teams goes. Prince and Moe form a lethal 1-2 punch on this team. Moe is capable of a 200+ game at any time. You never know what you are going to get, but he can make some difficult shots look easy. Prince is Mr. cool, putting in his 180 week after week. But he's been on a slide recently. Riz Patel made an appearance and he showed a new bowling style. He was getting spares and is no longer throwing the ball straight. So Riz could become that third bowler that Prince and Moe need. Matt looks like he could be a force to be reckoned with in the future with his solid curve. The team has great depth, but has been done in by its attendance. Prince will show every week, what about the others? The predictions about Guerrier have been dead on so far. He's tied for third right now with an average near 184. He's also tied for the league lead in points won. We all know what Gage is capable of, but he's been off. After the summer where he dominated from the #1 spot, he's had some trouble being the teams 2nd best bowler. We except him to turn it on soon though. The issue lies in the rest of the roster. Pat and Uday are struggling right now. Yasar is a solid bowler, but is part time. This team is just like the Pin Pals. They have a great duo, but their success will be determined by how their other bowlers do. For all the negativity Force gets about their attendance issues, Balls 'n Strikes has had worse attendance. You will not win in this league without a full roster, and they found that out the first two weeks. This past week they finally had a full squad and played the Pin Smackers nearly dead even. At full strength this team has a lot going for it. Wahid started off the season slow, but last week he took 2 points from Abhi, with games over 180. Shumail and Hakim really give this team great depth. Who will be the 4th bowler? If they sort out everything, watch out for them as they will quickly rise in the standings. These 2 teams are looking to rebound from an abysmal week by getting swept at the hands of their opponent. Force lost to the current champions Pinpals by a score of 19-4 and Snipers lost 18.5-4.5 to Asian Sensation. Poor Prince, his roster should be on the back of a milk carton as they have been missing a ton of games. Moe, Riz and Matt have each missed 3 total games, which is why as of now Force is not a top team. Prince has to make some phone calls to these bowlers if he wants to come out with a victory. If Force shows up with full strength they can compete with any team. Prince is currently the 7th best bowler in the league with an average of 176, but knows he may have to bowl higher to beat the Snipers. 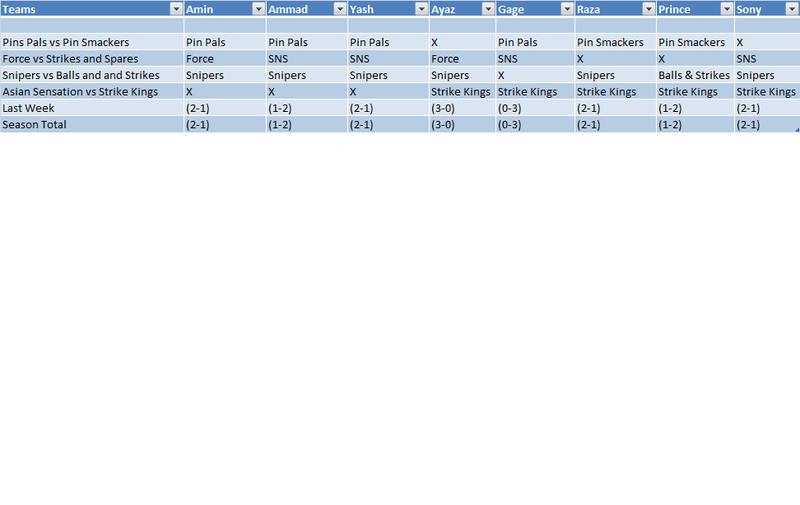 Snipers also ran into an improving team in the Sensations last week as they couldn’t muster to win one game. The Snipers have the leading candidate for rookie of the year in Guerrier who is averaging a 183 per game, and improving every week. The problem with this team isn’t Guerrier or “Chocolate Thunder” Gage, it’s their 3rd and 4th bowler. Pat and Uday both average fewer than 100 pins and are going to need more if they want to defeat Force. Get your popcorn ready as these 2 teams will be very entertaining to watch with the smack talk, as well as game play at its finest. Both teams came off convincing victories by sweeping their opposition. Chris & David took advantage with their handicap score, and Asif and Ayaz were too much for Force. Pinpals faced off against Force by sweeping and totaling 19pts. Ayaz "Daddy" Dar finally had his actions do all the talking. The Sensations unveiled Amin and Jin’s new balls to the league as Jin bowled a 211 in the 3rd game and Amin had a 150+ average last week. Even with their anchor Khaled "silent assassin" missing last week The "Shark" Yash took on the anchor role, and went head to head against the terminator Guerrier Connor. 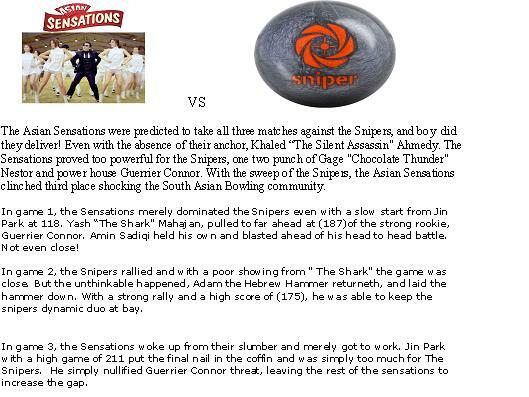 The Sensations came away with 18.5 pts last week when they played The Snipers. With all the talking on Facebook the question will be if Yash “ The Shark” will rise up and back up his talking. If Khaled is not there Yash will be going up against Ayaz who is known as the 2nd best closer in the game. Ayaz an Asif are more than just talking as both of them average over 175 pins a game. They both have championship experience, and know what it takes to get the job done. In this matchup they will not be the X Factor for the Pinpals. Dave and Chris who have been bowling inconsistently will be the difference makers. They both average under 136 and they are going to need to do better if they want to come out with a victory. This is as close as it comes but Ayaz’s Mouth will be too much for Yash and the Sensations as PinPals take 2 of 3 . Balls n Strikes have been improving week by week as they took 11 points from a formidable opponent known as the Pin Smackers. Wahid has been the anchor for Balls n Strikes that keeps them in games as he is averaging 157 pins with a high game already of 186. He will need to do this again as Strike Kings is one of the best teams in the South Asian Bowling League. Abdul and Mustafa both bring a handicap of over 80 points which may be the difference in this matchup. If one of them can have a good game it will ensure a Balls n Strikes Victory. Strike Kings brings the number 2 bowler in the league with Don Ali and a strong supporting cast. The question for Strike Kings is whether or not Eddie Santana will show up for this match. He currently averages well over 200 so he will give Strike Kings a good chance of winning this matchup. Ammad has proven he can bowl anchor if needed as he bowled a 201 earlier this season. Ammad may have to do that again if Eddie does not show up for this matchup. After losing by one point to the Pin Smackers, if Balls n Strikes can beat Strike Kings they will be a team that no one will want to face. I believe Strike Kings will rebound from last week’s hiccup by sweeping Balls N Strikes! This matchup can’t get any better with the top 2 teams in the standings facing each other. The Pin Smackers are looking to rebound from their subpar performance last week. They won 1 game, but redeemed themselves by getting total pins, and 7 individual points from the expansion team Balls N Strikes. As for Strikes n Spares , with the controversy surrounding the team and the suspensions levied against them , they surprised everybody. They took the first game and 14.5 pts on top of that. I can only imagine what would happen if Mr. MVP showed up for the matchup. The real question is, do they really need him? This will obviously come down to the 10th frame as both teams have great depth but with Mr. MVP back in the picture , this will be very tough for Ahbi the "mayor" and his team to overcome. 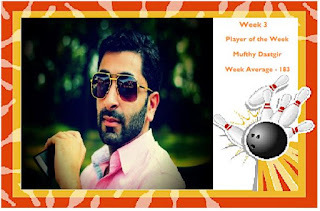 South Asians First Bowler of the Week goes to Mufthy Dastgir. Even though he didn’t have the highest weekly average, he had the biggest match up going head-to-head with Don Ali and beating him all three games. Mufthy bowled a 232 scratch the first game when Strikes and Spares were down 1 man due to suspension. His 183 average wasn't the best of week 3, but he took on one of the best bowlers in the league and won. He showed up and showed the league that even without Jason, the team still has what It takes to win. Beginning of the game, Pin Smackers were amped up having Adam bowling a turkey to provide energy and support to Pin Smackers. During this game, Hakim found his game which greatly helped the Balls n Strikes to sustain the lead. This came to no avail as Adam bowled a 160 and the mayor bowling a 245. You have to think with Adam bowling the way he did there is no way the Pin Smackers can lose. 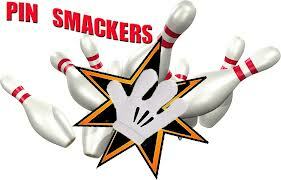 Pin Smackers came back to win gave 2 to even out the points with 8 points apiece. As game 3 started you could tell that Balls and Strikes were worried after Pin Smackers overall game 2 performance. The handicap was much higher than Pin Smackers has faced and anticipated. The X factor Sony has bowled phenomenal to motivate the team but lacked the support by the whole team's performance which led Balls & Strikes to a victory. Wahid's stellar and consistent performance has helped the team's victory, including Hakim's Game 2 & 3 performances. 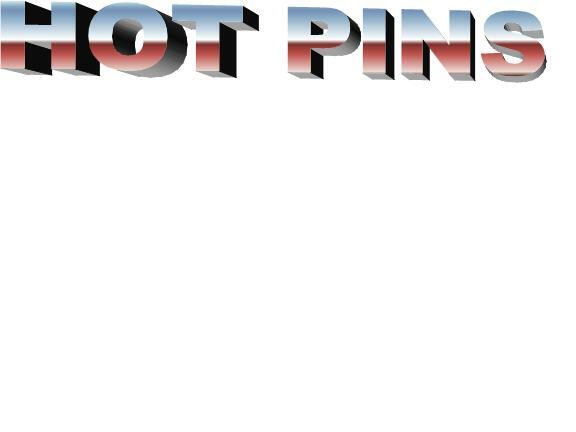 Watch out for Balls & Strikes as Hot Pins has said they are the team to watch. The Strike Kings were by a majority of the critics to take all three games and total pins. Firstly, they were missing Eddie once again this week so that took away some potential high games for the team. They also lacked Nisar who had been key in the first two weeks. Nisar was covered by newcomer Azfar Malick. For Strikes ‘n’ Spares, they were missing Jason Reis, the top bowler in the league due to a suspension. On top of this loss, Naeem was “blinded” for the first game and given a score of 150. This was due to improper bowling that fell under the category of “tanking.” Ironically, tanking was a chief complaint of Raza of Strikes ‘n’ Spares and one of the reasons why the league implemented a match scoring system. In game 1, Strike ‘n’ Spares won easily due to Mufthy’s 232 plus 41 pins handicap – a high handicap for someone who was known in season 1 to bowl over 200 quite often. Individual matchups were won by Raheel and Azfar for the Strike Kings and Mufthy and Amaad for Strikes ‘n’ Spares. Game 2 came down to the 10th frame and was won by the Strike Kings by only 11 pins. Raza bowled a 130 and Mufthy bowled a 147 which left the door open for the Strike Kings to win. Raheel and Don Ali had strikes in the 10th frame and Ammad had a spare – just enough to win the game. The final game saw the Strike Kings trying to claw out a win but multiple strikes in the 9th and 10th frames by the entire Strikes ‘n’ Spares squad put the Strike Kings’ hopes to rest and sealed them total pins as well. 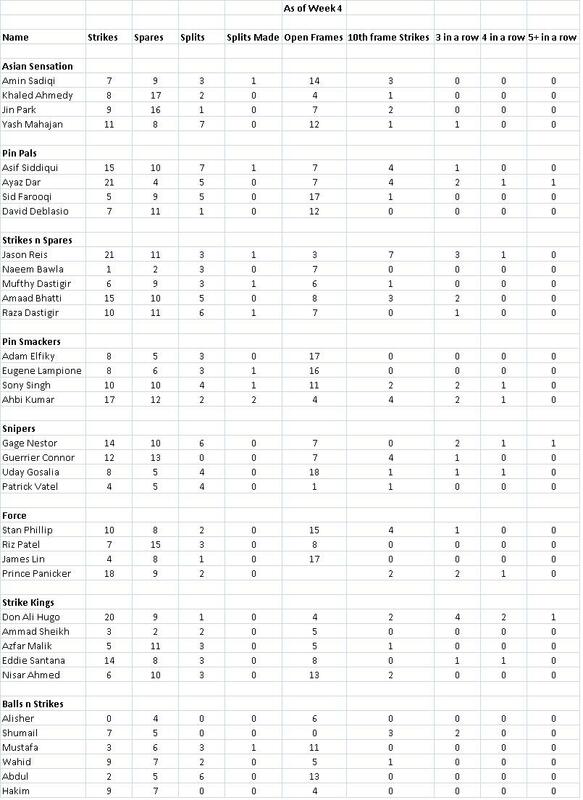 Overall Azfar and Raheel won 5 ½ individual matchup points for the Strike Kings while Mufthy, Amaad and Omair took 6 ½ points for Strikes ‘n’ Spares. All in all Don Ali had a bad day, bowling below his average while Raheel bowled above his average all three games. 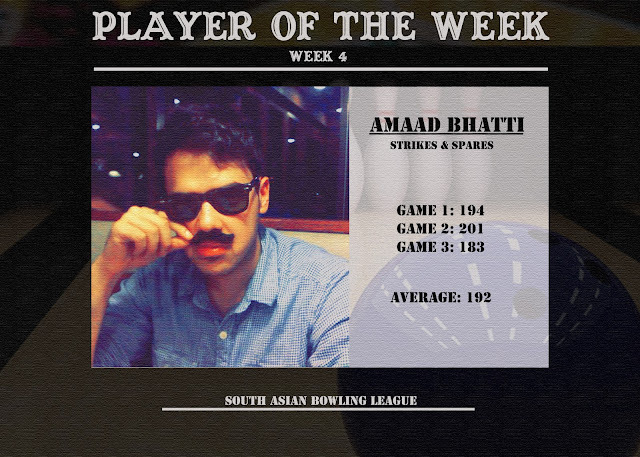 Amaad was the most consistent bowler for Strikes ‘n’ Spares, bowling above his average all three games. 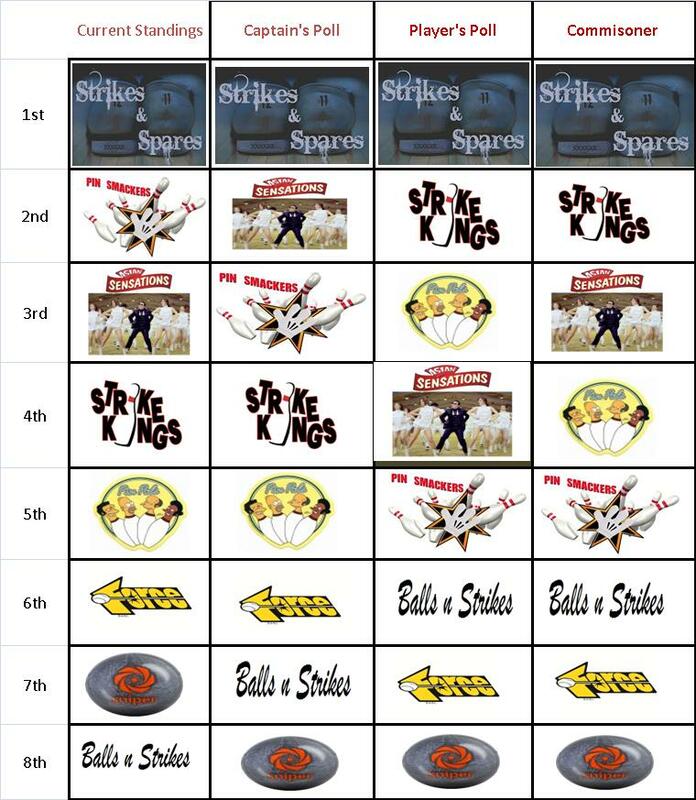 With today’s win, Strikes ‘n’ Spares are now in first place and the Strike Kings fall to fourth place. Ayaz Daddy Dar brings you his weekly segment Balls of Fury. This weeks guests include Sony Singh and Prince Panicker. This is the first week in which every team had 3 or more bowlers show up for their matches. I can only imagine the captains must have made some very angry phone calls beforehand. Imagine how good Force would be if Riz and Moe decided to show up every week? Did someone make Abhi mad? He has risen to the number one average in the league with a score of 202. He is currently the only bowler with an average above 200 who is eligible. Maybe Daddy Dar should stop talking so much and start worrying about his team. The "defending champs" are currently in 5th place. The one-two punch that no one is talking about is Gage and Guerrier. If Uday can up his stats in the near future, this will be one scary team to face. Raise your hand if you predicted Asian Sensation being in third place by week 3. Raising your hand? You’re probably the only one. Does Strikes and Spares really need Jason? They have taken care of business without him the last 2 weeks. Is it possible that Jason is actually overrated? Balls and Strikes has a lot of work to do. But this is one team no one wants to face later on in the season-especially if they start heating up. Will the real Strike Kings please stand up? When you need Ammad as an anchor you know something isn't right. For any player/team that has yet to pay, the deadline is the start of week 5. If any player or team has not paid by the start of the matches week 5, they will be suspended until full payment is received. No additional exceptions will be given. Exceptions were given to a couple that asked in advance. This matchup would have been a classic but Mr M.V.P. is ruled out of the match because of an suspension , nonetheless this matchup will be intense . Strike Kings losing 2 out of 3 to the Sensations without Eddie and his patented "B*TCH SLAP" pose after every strike but Don Ali and Ammad pummeled the Sensation to take the last game and TOTAL PINS!!!!!! SnS will realize that they are not playing the lowly FORCE in which they SWEPT . This matchup will come down to how well The Dastagir brothers bowl , if they can stay CLOSE to Eddie and Don Ali , then it will come down to the dreaded 10th frame but with no MVP to go up against Don Ali , I cant see SnS doing much . Snipers coming off a productive week with winning 2 out of 3 from Balls n Strikes , Gage AKA don't call me "Vanilla Thunder" added a monster in Guerrier with hiss 200+ avg , a great addition to the league ! The Sensations came away with winning 2 out of 3 from the Strike Kings but were very lackadaisical at the last round where they lost the round and TOTAL PINS ! This matchup will be a no contest because of the fact that a little birdie told me that Amin and Jin have bought their own ball and with "THE SHARK" & "THE SILENT ASSASIN " will be difficult to handle other than Guerrier winning a couple of matchups , that's all i give the Sinpers. These 2 teams are coming off a HORRIFIC week , With Force getting a measly 2 matchup pts against SnS and Pinpals getting 6 individual pts as both teams were SWEPT !!!! Ayaz AKA "7-11 mouth" which never closes had nothing really to talk about ........UNTIL NOW , going up against lowly Force is the perfect remedy for the PinPals. Unfortunately with Halloween around the corner the HORROR show continues for Prince and the rest of Force!! Pin Pals take 3 of 3 with a clean sweep. Balls n Strikes are up against another high caliber team in the Pin Smackers as they are going up against "THE MAYOR" Ahbi. BnS have a great anchor in Wahid and Ali has shown he can hang with the best of them but they did take only 1 out of 3 from against the Snipers. Pin Smackers took care of business last week by SWEEPING the Lowly Pin Pals . Here is the schedule for week 3. Please note that matches start at 10AM with 945AM warm-up. This match up could get ugly for the Sensations as they are facing another high octane caliber team in the Strike Kings with Eddie and Don Ali bowling over 200+ and Nisar holding the fort down and Raheel and his huge Handicap score this will be close to impossible for the Sensations, especially with Reis 2.0 missing. The sensations will need Jin and Amin to step up big time but we all know that Yash and Khaled are capable to keep thier team competitive. This match up welcomes 2 new teams and it definitley showed last week , Balls 'n Strikes only advantage will be their handicap score but if newly acquired Shumail Haque plays then outcome could be close. As for the other new team Snipers and their capt Gage AKA Chocalate thunder showcased Guerrier with his 192 avg but they are lacking with Uday and Pat with both avg under 100 pins. This match up favors the Force for 1 reason only , Mr. MVP will not be playing this week and what a break for Force! At the same time Force has depth at thier rotation with Prince , Moe and his incredible hook , as well as Riz and a newbie to the league Mat. The only way the SnS has a chance if their first 2 bowlers can match Force First 2 bowlers. Omair has to come up huge again as he did last week against the Sensations. SnS eeks out 1 victory as Force takes 2 and total pins, if Mr MVP was there this would be a clean sweep for SnS . Pin Pals are looking to redeem themselves this week with a poor outcome last week by just accumulating a meekly 4 points so Ayaz and co. are looking to rebound but it will be a difficult task by going up against Pin Smackers who are led by Ahbi and his lethal tag team partner Eugene to go along with his patented discount double check pose. I can see Ayaz willing his team to a victory as well as David shaking off the rust from taking the summer season. 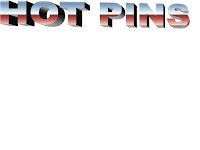 The Pin Smackers will find out that this is no easy opponent as it was last week. Do not get used to this sight. Once the handicap takes affect, near complete shutouts will be hard to come by. But this one was one-sided from the get-go. Balls 'n' Strikes only had 3 guys, and Wahid and Hakim looked rusty early. Meanwhile Moe and Prince were on from the 1st frame. Moe had a 501 series with his first 2 games being 189 and 177. Prince looked as good as he has all of the last 2 seasons, having a 614 series and a high of 220. Matt showed signs of being an up-and-comer averaging over 150, with a high game of 178. Riz had enough of a cushion from the rest of the team to start learning a hook... in the middle of the match. It led to better games as his last game was a 149. Force has ability to turn some heads as they look like they can be very deep. With games nearing 700 without handicap, Force is off to a great start. For Balls 'n Strikes, they have a lot of silver linings. Hakim had games of 153 and 169. Wahid finished strong with a games of 160 and 170. Both of these guys missed some very make-able spares (due to rust). They were missing Shumail, who was a top-10 bowler in season 1, along with Ali, who will provide great stability in the lead off spot. Their scores are not really indicative of what they can do. Their core is filled with experienced bowlers who will not be phased by other bowlers having big games, or by pressure spots. This team will spike in the standings once they get it together. But for this week, they get steamrolled by the new look Force team. Going into this match Ayaz “Daddy” Dar had a lot to say about his teams prospects in the league following the Pin Pals championship in the summer season. It would seem that this match was a reality check for the Pin Pals in that the Strike Kings took 19 out of 23 points from them. The first two games were won solidly by Strike Kings without any worry. In the final game Nisar, in typical fashion, was the Strike Kings secret weapon – he took two out of three games from Chris and successfully made an easy spare out of a split in the 10th frame of the third game. This coupled with a double by Raheel in the tenth frame crushed the beginnings of a comeback that Pin Pals had been making after Asif nailed a split just a frame before. Notably, Eddie and Don Ali had strikes in all of their tenth frame performances and bowled series of 649 and 637 respectively. While Ayaz and Asif were not bowling their best and lost all points to Eddie and Don Ali respectively, the fact is that Eddie and Don Ali are just one of several one-two punches in the league capable of doing the same thing to the Pin Pals. There were some comments about handicap perhaps making a difference in these matchups but the fact is that even with handicap (for Ayaz and Asif), Eddie and Don Ali still win all three points each. The Pin Pals will have to regroup for next week but don’t even think of counting them out yet. Surely, they will be back next Sunday with a vengeance, though likely with less smack talk. The Strike Kings made a great first week showing, and the addition of Eddie to the lineup looks like a great free agent catch. Going in to this match, both teams knew this wasn't going to be a easy win. In the end, SnS took the win because of one simple factor, DEPTH. The first game was won solidly by the Asian Sensations with Yash "The Shark" Mahajan scoring a 213, and new member Justin Reis scoring just high enough to negate his brotherly counter part Jason "The Dictator" Reis. With no real help from the Dastgirs, SnS couldn't hold them off. From there on, it went down hill with no help from their former anchor Khaled " The Silent Assassin" Ahmedy who bowled well below his average at 155. The 2nd and 3rd game, SnS hit their stride, where the new comer Omair and his Fred Flintstone technique overwhelmed the Sensations defensive prowess. He will put David Deblasio, Adam C., and Nisar's straight technique to shame with practice. The Dastgirs kept up but were lack luster after weeks of comments and pictures on facebook. The real powerhouse of the team was of course Jason. "The Dictator" properly named after a Sensation member, simply because he dictates how well his team will do in clutch situations. His slow start 210, and 257, 247 to follow were just too much at anchor position for the Sensations to hold off. 210 a slow start, lol! The SnS supporting cast has to pick it up. As good as Jason is, he should not have to be carrying a team this talented with 250's needing to win. They lost when he bowled a 210, and he HAD to bowl a 247 to carry them to a win in game 3. Only game 2 did they win comfortably. Interesting to see how the team responds next week. 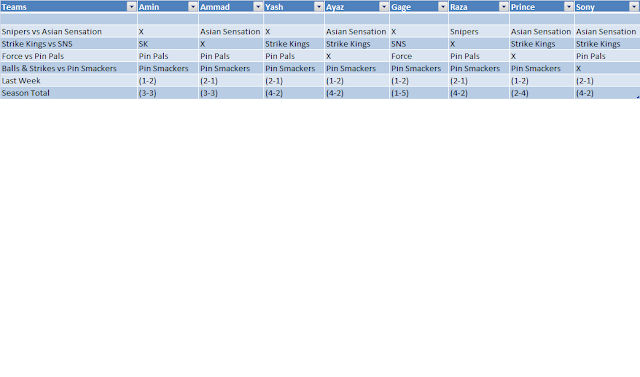 The Pin Smackers started the season off with only 3 guys vs a full roster of Snipers. The first game was a very tight match for the first half of the match. It was back and forth till the 4th/5th frame where Eugene and Abhi both hit turkeys to push the lead into the Pin Smackers favor. The Snipers didn't back down and positioned themselves for a huge upset if they could bowl down the stretch. But they missed some key spares, which gave Pin Smackers the easy win. Similar to game 1 The Snipers bowled a 516 as a team, Guerrier stepped up as an anchor and carried the team who bowled a 200 game and beat Abhi for an individual point. Despite Guerrier's huge performance the rest of his team was unable to bowl their best. The Pin Smackers were very composed as a team and bowled just enough to take a game 2 victory. The momentum changed in the 7th frame, as the Pin Smackers closed out and secured another victory. Eugene again with consistency and the mayor Abhi, continues to help the load as Adam struggles in Game 2 but got enough pins for the victory. In game 3 Eugene and Abhi had to work hard due to another 200 performance by Guerrier's. The Snipers were pumped up and did not want to be swept, and Gage stepped up and bowled a 192 to follow Guerrier's lead. As the game went on to 4th frame, the momentum slowed down a bit from The Snipers, though still in a lead of 60 pins after the Pat and Uday missed spares. Pin Smackers, once again took advantage with Abhi's turkey and Eugene doubles and spare. Toward the 10th frame, Snipers couldn't finish the 10th frame strong and didn't have enough to steal a victory from Pin Smackers. 1. Strike Kings- Strike Kings took on the defending champions in Pin Pals in week one and they looked dominant. There is no clear cut #1 right now, but as of today they are number one. They have the best 1-2 punch in the game as of now with Eddie Santana (216) and Don Ali (212). If these two bowlers keep it up, they will be holding the SABowl cup in March. This combination can go up against any bowler in the league and ill strike fear in the competition. Nisar (143) who has gotten better every season has proved he will bowl when the pressure mounts, and has proven capable of bowling a big game. Raheel (127) will be getting the big handicap for their team and if he can use it to his advantage they will be tough to beat. It is still very early, but they look like the new favorites to win it all. 2. Strikes 'n' Spares - According to Las Vegas, they were tied with the Pin Pals as the pre-season favorites, but they did not look their best. They took 15 out of 23 possible points in week one against Asian Sensation. It is still early so averages will be inflated, but they are lead by the MVP of the league Jason Reis. Jason is averaging a remarkable 237.7 and has already had a series of 713 which may be the top series throughout the season. Mufty Dastgir (154) and Raza Dastgir(173) are excellent role players that Strikes and Spares will need down the road. Mufty will have to pick his game up if Strikes and Spares wants to fulfill its role as league super team. Their problem may be coming up as their handicap is very low, so we will see how they respond. The X Factor Omair (153) did his job and was a huge factor on my Strike and Spares came out with the victory. Some issues are still how some of the players will close and handle the pressure. It is still early, but they need to pick it up if they want to compete with the best. 3. Pin Pals - After all the trash talking from their Captain Ayaz they came out and laid an egg this past Sunday. 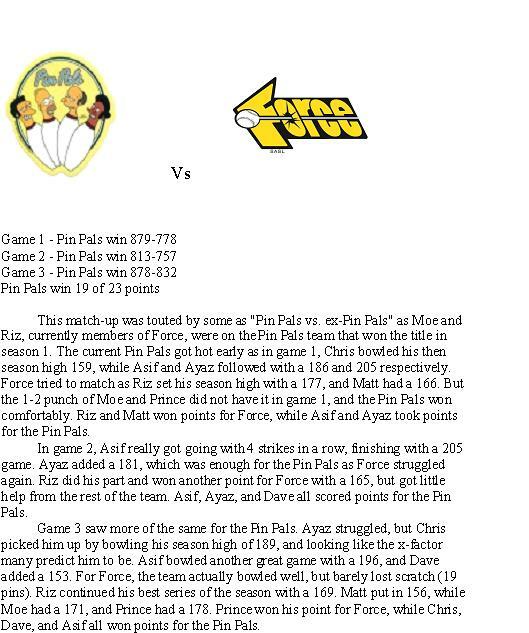 Only getting 4 points is an embarrassment to Pin Pal nation and I’m sure Ayaz had problems sleeping that night. When you play Don Ali and Eddie with the way they bowled Pin Pals are lucky to get 4 points. Even though they had 4 points they are still 3rd in power rankings. Ayaz (171), and Asif (173) have the ability to match any other 1-2 combination in the game. They have playoff experience that no other team has and it will come in handy. It is only week 1 so we are not going to jump to conclusions on why they bowled poorly. Ayaz outside the MVP is the 2nd best closer in the game, and will bowl when it counts. Chris (133) and David (146) showed that they didn’t bowl in a long time and were rusty. As the season goes on they will only get better and the Pin Pals will be close to the top of the leader board. 4. 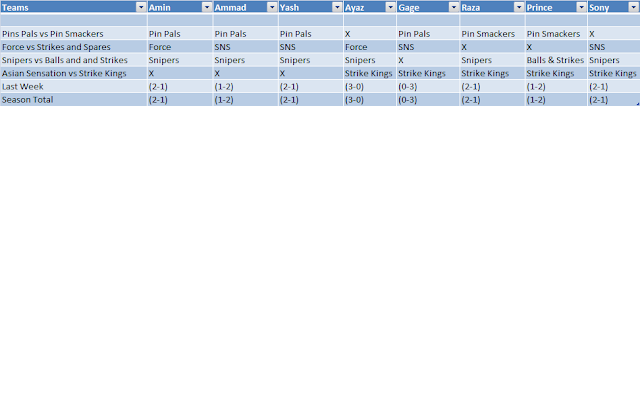 Pin Smackers - The Pin Smackers are not the prettiest team in the league but they get the job done. Ahbi (196) aka The Mayor came out strong with a 215 game to set the tone for the rest of the series. They collected 20 points which is a great beginning. However, when you bowl a team who has two players average under 100 you should take 20 points or more. Nevertheless, Pin Smackers looked dominant. Eugene (176) aka Aaron Rodgers is a solid number two bowler and he and Ahbi have great chemistry. Eugene has big game potential to bowl over 200 which the Pin Smackers are going to need. Adam (100) has to pick his game up. It is very early but averaging 100 will not get it done and Adam has to practice if he wants to give Pin Smackers a chance. Sony was not available to bowl, but when he bowls he brings energy and big game potential that the Pin Smackers are going to need, and will send this team to another level. The Pin Smackers need to practice if they are going to compete with the best. But once Sony returns, they will be heading in the right direction. 5. Force - Team Force is the underdog team this year as no one takes them seriously. They may be one of the scariest teams in the league for that reason. Even though they are #1 in the standings, they are ranked 5th because they have to show the league more than just picking a part a team with only 3 bowlers. Prince (204) has quieted all the critics who said he’s tanking and bowled lights out. Prince has slowly gotten better every year and I expect him to bowl even higher. Moe (167) not only brings championship experience but one of the craziest hooks you will ever see. Moe has the potential to bowl well over 200 and bowlers around should be scared. Matt (154) is new to the league but a 154 average looks low for him, as he has a nice hook. If he can practice expect his average to reach in the high 160’s. If Riz (133) shows up on time he is the 4th guy to a very dangerous team. He learned a curve mid-match in week 1 and immediately got results. Riz like Moe was on the Pin Pals and knows what it takes to get done. The problem with this team is attendance. Three of their guys showed up late and almost didn’t make it in time. If they are going to compete Prince has to make sure his team shows up to bowl. But the potential of this team is very high. 6. Asian Sensation - Asian Sensation had a tough week vs Strikes and Spares as they only took 8 points. Yash (196) has become a household name and is now known as “The Shark”. He has become more clutch every game and he will throw 3 strikes in the 10th frame with no problem. Khaled (155) was not himself that series but it is still early and I expect him to be at the 180 average as the season goes on. The Sensation needs Khaled to bowl well and keep up with the opposing anchors if they want a chance to win it all. Amin (143) bowled great on Sunday as he was their leadoff man and was setting the pace nicely for his team. Amin has shown great improvement and I expect him to get better. Here lies the problem for the Sensation. Their 4th bowler Justin (177) won’t be bowling again until December. With Justin on the team the Sensation are dominant. Who will be there 4th bowler? Can they win big games without Justin? Will they take advantage of the big handicap? Only time can tell. 7. Snipers - This may have been one of the most shocking games we have seen in a while. They have two bowlers Pat (89) and Uday (98) who average fewer than 100 pins. But this is their first time bowling in competition so we will cut them some slack. They have two dominant bowlers in Gage (151) aka Chocolate Thunder and Guerrier (192). Guerrier is their anchor had has already shown big game potential. He will not be scared to go against the other anchors in the league as he can bowl over 200 pretty easily. Gage brings championship experience to this team and will need to light a fire under his team if they want to compete. Uday and Pat must get better and bowl near the 120-130 range if the Snipers want to compete. I expect this team to be at East Meadow practicing every week. If Uday and Pat increase their games this will be a team no one will want to face down the road. Keep in mind that have Yasser waiting in the wings, and he is a solid bowler that will add depth. 8. Balls 'n' Strikes - Balls and Strikes did not think they would start their inaugural season only picking up one pin. We are not sure if it was pre-game jitters or lack of practice. There is a light to the end of the tunnel though. Hakim (147) and Wahid (153) bowled well for the most part and showed flashes of big game potential.This is week one and I expect their scores to be significantly higher. Abdul struggled and Ali didn’t show up which is another reason why they didn’t bowl well. Like Force, they have to show up if they want to win. You cannot compete in this league with only bowling with 3 guys. This team will make a major improvement and have a chance of making the playoffs and being a contender. They also just signed Shumail Haque formely of Force to their roster, which is a big addition. With Shumail, they become a very deep team that no one will want to face.